Views - Fairvest Properties: Punching Above Its Weight? Treasury yields in the US have risen sharply in recent months, knocking property stocks all around the world due to their sensitivity to interest rates. The share prices of the Resilient stable (Resilient REIT, Fortress Income Fund, NEPI Rockcastle and Greenbay) have declined by as much as 50% after allegations of share price manipulation surfaced in January. Given that the abovementioned companies constitute roughly 35% of the property index, it is no surprise that the SAPY is down 17% for the year. The issues with Resilient have forced investors to look deeper into the financial statements of their property holdings, and the message from the market is clear: it wants predictable income streams backed by quality, physical property. Not income streams sweetened by external and unsustainable income sources. Fairvest is a specialist owner of non-metropolitan shopping centres, including convenience, community and regional centres. These shopping centres serve the lower LSM market in what can be regarded as high-growth nodes situated close to key commuter networks. The portfolio currently consists of 41 properties valued at R2.08 billion. A key strength that continues to drive Fairvest’s outperformance over its peers is its specialist focus on lower LSM community and neighbourhood shopping centres. Their portfolio differs from the likes of sector heavyweight Hyprop, which owns dominant larger shopping malls that are facing headwinds in the form of oversupply and a secular shift to online retailing. 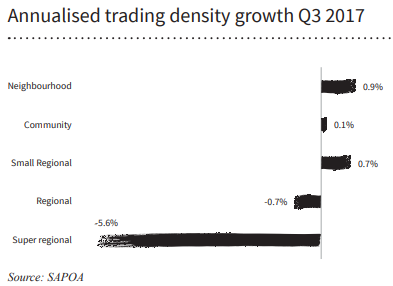 The stronger performance of community and neighbourhood centres can be seen from the chart below, which compares the trading density growth of the different types of retail properties for the third quarter of 2017. Fairvest increased its distributions to shareholders (DPS) by 9.53% for the six months to 31 December 2017 - well above inflation and in line with the roughly 10% growth achieved during the past three years. At a price of R2.20, Fairvest trades at a 2018 DPS yield of 8.71% and in line with its Net Asset Value (NAV). Whilst the stock has rerated in recent months (it typically trades at a 10%-15% discount to NAV), I believe it will continue to outperform the SAPY and provide sound, low risk prospective returns for its shareholders. This is due to its leading position in its sub-market, strong operations and selective opportunities for small, bolt-on acquisitions. Investors are effectively buying an instrument with an 8.7% yield that has the ability to compound at around 9% over the medium term. Fairvest’s total shareholder return during the past five years was an impressive 117% and I see it as a benchmark that should be sustained over the next five.